At CB Furniture you can do pick-up your items yourself, but you don't have to! For your convinience, we offer great service depending on what you need. Whether it's just assembly, delivery, or both. Yes, we deliver! 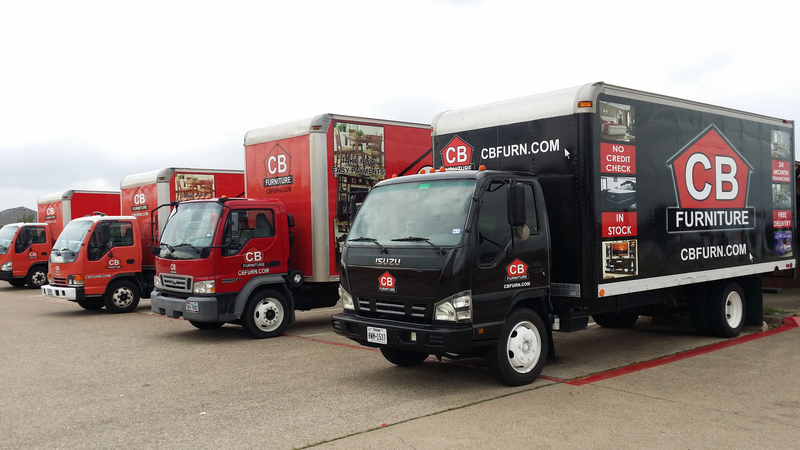 Shop your heart away, at CB Furniture we offer free delivery to Arlington & Grand Prairie as well areas nearby. For more information click here. We also offer a low one-time delivery fee to most in the DFW area. Regardless of the amount of pieces, weight, or size of the order! We will deliver it all inside your house and into the desired room if you wish! Delivery fees are determined by zip code and start at only $49! The delivery time frame depends on how busy we are but we try to keep it within 1 to 3 days. Please check with the store before purchasing for more precise dates and times. You can always schedule delivery for a later date if desired. Please keep in mind that delivery fees do not include assembly or set-up. If you wish we can also assemble your merchandise. Assembly fees vary by item and amount of items being purchased. Please check with us for more precise set-up fees.